Distractions that take a driver's eyes off the road have been causing accidents for as long as there have been vehicles. But with the advent of the smartphone, distracted driving has risen to a whole new level. Thousands of South Carolina residents die or are injured each year because of inattentive drivers. After a car crash, you need a distracted driving accident attorney to prove the distracted driver's negligence and get you compensation for your injuries. Texting while driving is often the most dangerous form of distracted driving. In the five seconds it takes to type out a quick text, a car on the highway can travel the length of a football field. Traffic conditions can change quickly and those five seconds may be all it takes to cause a high-speed collision. Other forms of distracted driving can be risky too. When people are engaged in telephone conversations, their hands aren't on the wheel, and their minds aren't on driving at all. While grooming or eating, a driver's attention and coordination can be split, putting them at a higher risk of a crash. They may not be prepared for a quick lane change or an unexpected obstacle or pedestrian in the road. Distracted driving accidents can be some of the most serious. Because the at-fault driver is not paying attention to his or her surroundings, he or she may not even know to brake before the collision happens. The higher the speed of impact, the more likely serious injuries will result. So a distracted driver has a chance to catastrophically injure passengers or other motorists, without even realizing it ahead of time. In 2014, South Carolina passed a law making it illegal to text and drive. The ban prohibits using a wireless device to "compose, send, or read a text-based communication while operating a motor vehicle." That includes text messages, email, and instant messages. The ban does not apply to other uses of smartphones, including dialing or holding the phone, or to the use of non-communication apps like GPS navigation tools. After a serious auto accident, your attorney may need to take extra steps to prove the other driver was distracted and caused the crash. 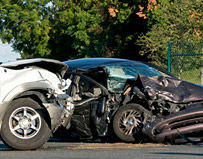 In South Carolina, you cannot be compensated for your injuries unless the other driver was at fault for the accident. In some cases, the driver may have been ticketed for texting while driving or may have admitted to looking at his or her phone just before the crash. Traffic citations for distracted driving are the best way to prove negligence in these kinds of accidents. 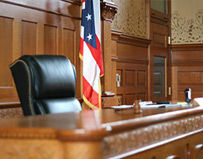 But even if the police did not write the other driver a ticket, your attorney can prove that the driver was negligent or reckless by showing he or she was unreasonably distracted while driving. 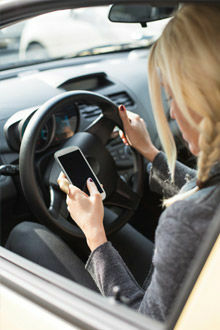 Then it will be up to your distracted driving accident attorney to subpoena phone records, email, and other electronic records to prove the motorist was driving distracted. It may be necessary to hire an accident reconstruction expert to determine exactly what happened to cause the accident and whether some distraction was to blame. Any time a cell phone is involved in your car accident, you need to contact an experienced distracted driving accident attorney like Nate Fata. He can help you understand the laws and use them to your best advantage. He knows how to gather the evidence to demonstrate the other driver was distracted. 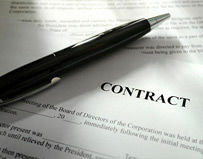 Fata Law can help you prove your case and get the compensation you need to pay for your injuries and medical expenses. For certain Horry Electric homeowners who built a home in accordance with Horry Electric Good Cents Specifications. For driver rear ended at stoplight.